"My father, Szoel Frydman, who wrote his works under the pen name of Leib Rashkin, was born in 1905 in the town of Kazimierz Dolny, Poland. 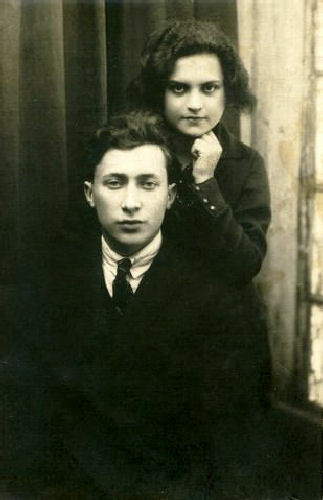 He began to write in Yiddish at an early age. In the early thirties, he published the novel "The People of Godlhozhtz" (a town in Poland). For this book he received the important Y. L. Peretz literary prize. What is remarkable about this story is that it was published during the Second World War, when Poland was already occupied by the Nazis. My father was then in Brisk, which was still under Soviet rule. It appeared in the bimonthly magazine "Shtern" in Minsk, in Sept.-Oct. 1940. The last news of my father was on Nov. 13, 1941, when he was on the list of the inhabitants of the Brisk ghetto. He was killed in the Holocaust, like most of his large family." Read Szoels' story, "In the Polish School."